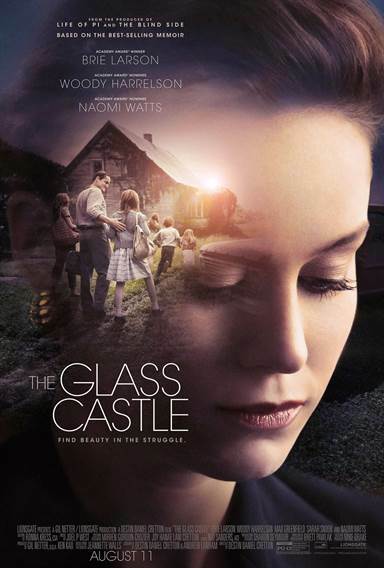 Download The Glass Castle in Digital HD from the iTunes store. The Glass Castle images are © Lionsgate. All Rights Reserved. So many times in Hollywood films the alcoholism of one of the characters becomes the main focus of the film. We see the individual falling down, slurring their words, making horrible life choices, being abusive and destroying, at best, their own lives and at worst the lives of those around them. 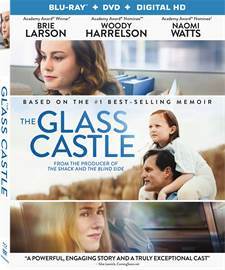 While The Glass Castle addresses the elephant in the room, it doesn't permeate the entire story but merely adds to the plot as if it is also one of the many characters in the film. It serves to move the story along but doesn't overpower the relationship between Jeanette Wall (Brie Larson; Room, Kong: Skull Island) and her father, Rex (Woody Harrelson; Cheers, Now You See Me). Based on Jeanette's memoir about her life growing up in poverty with an alcoholic father, The Glass Castle is a mix of warmth, love, despair, and heartbreak. Jeanette is the second oldest child in a family of four. Her mother, Rose Mary (Naomi Watts; Mulholland Dr., The Ring) is an artist and her father, Rex, is an occasional handyman, sometimes blue collar worker and most times, alcoholic. For the first six years of her life, Jeanette and her family moved often as her parents' debts would mount. By age seven, the family moved to Nevada and enjoy some stability as Rex has a steady job. However, that doesn't last long and the family is forced to move again, first to Arizona then to Rex's parents in Welch, West Virginia. When Jeanette discovers her brother Brian (Josh Caras; Definitely, Maybe) being molested by their grandmother, the children suspect the same fate had befallen their father. Forced to move once again, they live in a dilapidated house with no indoor plumbing as Rex dreams of building his dream home, The Glass Castle, on the property. As the children grow older, they eventually flee and end up in NY with their parents following behind. As Jeanette becomes more successful, she alternately helps and shuns her parents until her father's death. The beauty of this story is the warmth and love shared between a daughter and her father and the closeness of the whole family despite being extremely poor. They watch as their father, who is alternately fun loving, tender and abusive, spiral downward and squander any money they have on alcohol. We also see Jeanette struggle with conflicting emotions, as she desperately wants to love her father, especially when he is warm and loving, yet can't seem to get past his alcoholism. Larson is excellent as we see her warring with her emotions about her father. She once again reminds us why she won an Oscar for her role in Room. Harrelson is superb as Rex, the loving father who wants to do right by his children but can't seem to give up the bottle and Watts adds another layer as mother and wife who can't seem to leave her husband despite the poverty and abuse. The supporting cast is very good too, especially the children who portray the younger versions of Jeannette and her siblings. The 1080p high definitely video offers a sharp picture quality despite the deliberately dingy and gritty feel and muted color palette seen throughout the movie. The darker tones help to immerse the viewer in Jeanette's world, which is one of old, rundown houses. The Dolby TrueHD 7.1 audio is crisp and clean as the dialogue can be clearly heard over the background soundtrack. The combo pack offers some interesting extras, especially those that give insight from Jeanette herself. They include: Deleted scenes, The Glass Castle: from Memoir to Movie, A Conversation with Jeanette Walls, Making of Summer Storm By Joel P. West and Scoring the Glass Castle. While slow at moments and missing a certain draw, The Glass Castle is a beautiful film detailing the tumultuous tale of Jeanette's love/hate relationship with her father. As we see at the end, she seems to reconcile her emotions about her parents and ultimately makes peace with her upbringing and her cruel yet loving father. A catharsis of sorts, it cleanses the soul and aids in the healing process.